Longevity. Even under the best conditions, many outdoor structures will need regular maintenance and eventual replacement. The right materials can significantly extend service life, making higher initial costs worthwhile. Decks in particular suffer grueling conditions. The number of specialized building products, especially for exterior decking, has increased dramatically in recent years, reducing maintenance requirements without sacrificing durability. Structural integrity. In-ground concrete piers and wood framing, not full-depth foundations, typically support exterior decks and porches. Framing materials, connectors, and fasteners that can handle outdoor conditions are vital. 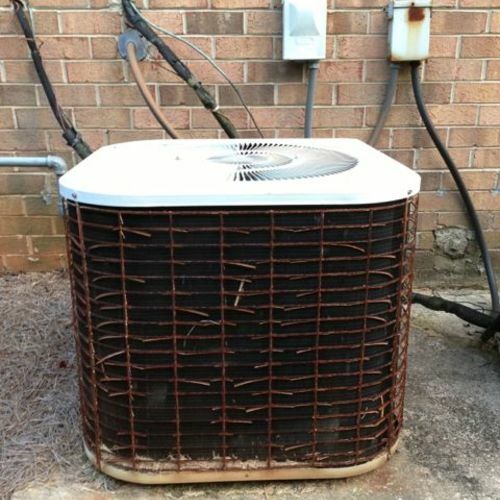 Of particular importance is the connection between deck and house, an area susceptible to decay and responsible for heavy structural loads. With porches, it’s important to maintain a continuous air barrier behind where the porch roof connects to the house. On new houses, the wall sheathing is often left out in this area. Future plans. If the deck or porch may eventually become an enclosed, conditioned part of the home, incorporating features now that will accommodate those future changes will save time, money, and materials over the long run. Porches do a lot of good things: They shelter windows, doors, and siding; they provide a protected place to enjoy the outdoors; and they connect neighbors to neighbors. In many regions, porches are lower-impact/lower-cost quality space than conditioned space would be. Porches are exposed to weather, so they must be designed so that they don’t trap water, and they must be built from materials that can withstand the elements. Compared with a simple deck, a roofed and screened porch often has more places for water to hide and, as a result, a greater potential for decay. Many homeowners want a richer level of detail and finish for their porches, so builders construct hollow columns that look more elaborate but are also are more susceptible to decay. Air circulation and an ability to shed rather than trap water are essential for long-lasting porch components. Unlike the continuous concrete footings and foundations that support a house, most decks are built to transfer structural loads to the earth through a series of posts and concrete piers. A typical deck foundation starts with a series of holes deeper than the frost line. Concrete footings are poured in each hole. Then cardboard Sonotube forms are set in each hole, with the top of the Sonotube a few inches above-grade. Concrete is placed in each form, and an anchor bolt, if required, is installed. A post-base connector is secured to the concrete with a nut. Pressure-treated posts carry the load of each beam to the concrete pier. The number of posts and the footprint of the concrete footings and piers will depend on the size and weight of the structure and soil type. Products such as Bigfoot Systems make it easy to pour the footing and pier at the same time. Wood posts, even pressure-treated posts, should not be buried in concrete. Galvanized steel post connectors help maintain an air space (capillary break) between a concrete pier and a pressure-treated post. Some connectors are placed in the concrete while it is still wet using a plumb bob and layout lines; other types are installed over threaded J-bolts after the concrete has cured. Innovative approaches to deck foundations include helical and pin piers. Both are material efficient and reduce site disturbance. Ledgers are the most vulnerable part of a deck, and they should be avoided entirely if possible. A free-standing deck with an independent foundation will last longer and cause fewer problems than a deck that is attached to the house with a ledger. A ledger can easily become the cause of serious decay when it traps water against the house. If used, a ledger must be be strong and installed with details that shed water away from the house. This is important for ground-level decks, but critical for decks above ground. If you use a ledger, a single ledger is usually sufficient structurally and from a durability standpoint. 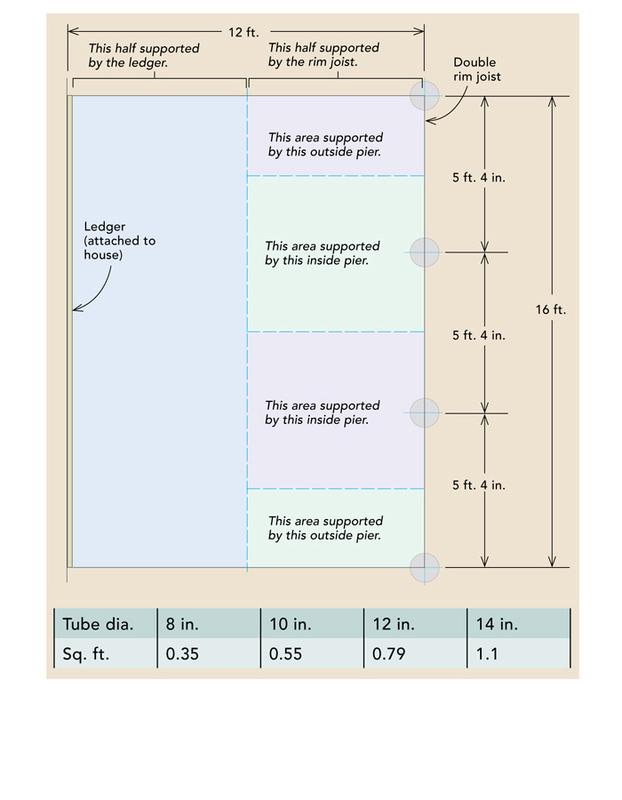 Some builders use a double ledger for decks that are wider than 8 ft. One advantage is that the deck board closest to the house can be installed without puncturing the flashing. Applying a layer of self-adhering membrane to the sheathing before the ledger is installed helps protect the house from water intrusion. The ledger must be flashed so that water can’t be trapped against the house. Flashing that protects the top of the ledger and prevents water intrusion behind it should extend up the sidewall of the house. 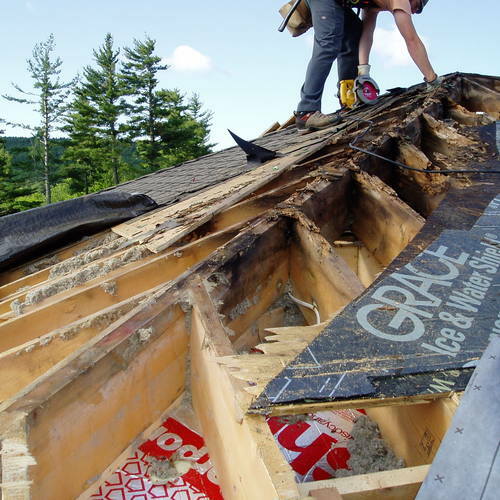 The top edge of the flashing should be covered by building felt, housewrap, or a self-adhering membrane such as Vycor, made by Grace Construction Products. Ledgers should made from pressure-treated framing material and be attached directly to the rim joist of the house. 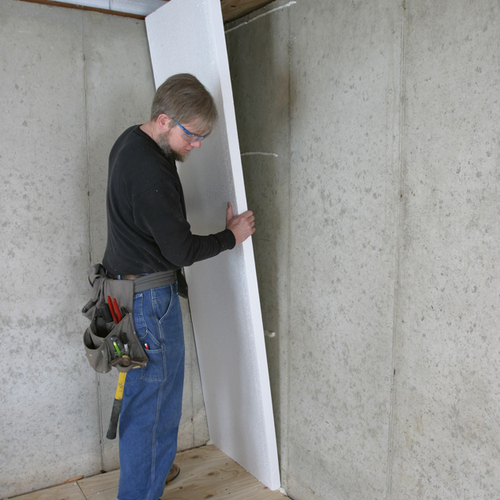 Connections to sheathing or other nonstructural components are unsafe because fasteners can be pulled right through wall sheathing. Standoffs located between the ledger and wall sheathing allow any water that makes its way past the flashing to escape. 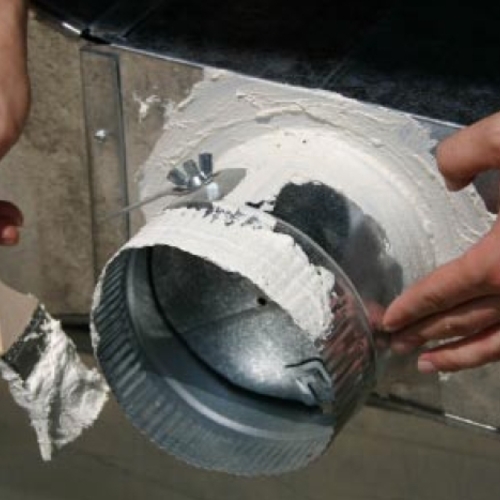 Standoffs can be made from pressure-treated plywood or from stacked galvanized or stainless-steel washers bedded in caulk. Bolts make the most reliable connections. If a lack of access to the back of the rim joist rules out the use of bolts, lag screws may be substituted. However, the screws should pass all the way through the rim joist and the pilot holes should be sized slightly smaller than the root diameter of the screw. Because of the corrosive nature of pressure-treated lumber, only hot-dipped galvanized, stainless steel, or other approved connectors should be used. Galvanized joist hangers and other metal hardware should be rated for use with pressure-treated material or isolated from the wood with a strip of self-adhering membrane or asphalt felt. 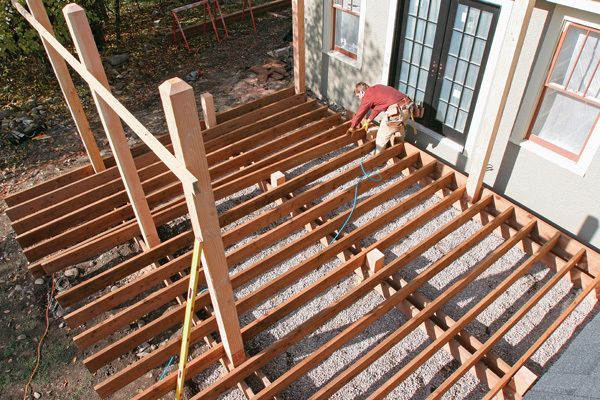 On-center spacing for fasteners decreases as the length of the attached deck joists increases. Minimum spacing for through-bolts is less than for lag screws. Pressure-treated lumber is not prone to either insect damage or decay, and it’s less expensive than the few alternatives on the market. Alkaline copper quaternary (ACQ) and copper azole (CA) are the two most common chemicals used to treat lumber. They are considered less toxic than the chromated copper arsenate (CCA) treatment they replaced in 2004, but both contain much higher proportions of copper oxide than CCA and can’t be handled like untreated lumber. Although new forms of treated material may be safer than CCA lumber, they’re not entirely benign. Manufacturers generally recommend wearing gloves and a dust mask when handling or cutting the wood, washing hands thoroughly before smoking or eating, and laundering work clothes separately. Scraps should not be burned. If you’re using pressure-treated lumber, make sure the treatment level is appropriate. Treated lumber is rated by the amount of chemical that remains in the wood, described as pounds of chemical per cubic foot of wood. Lumber used aboveground should have a retention level of 0.25; lumber used in contact with the ground, 0.40. Use appropriate fasteners. High levels of copper in treated wood will corrode steel or aluminum fasteners. Fasteners should be hot-dipped galvanized or stainless steel (or treated with another coating that is specifically rated for contact with CA and ACQ lumber). Galvanized fasteners are rated by the number of ounces of zinc per square foot of metal. The best are G-185. Joist hangers and other connectors also should meet the same standard or be isolated from direct contact with wood. Plastic lumber is an emerging product category that in time may give builders more options. While plastic lumber is not a typical substitute for wood, it has at least two environmental advantages over treated lumber: It’s nontoxic; and it can be made from recycled plastics such as milk jugs and detergent bottles. Plastic lumber reinforced with fiberglass also has several disadvantages — it’s heavy, expensive, and over time it can sag under a load, a phenomenon called “creep.” This lack of stiffness gives plastic lumber lower span ratings than wood. Plastic lumber is available in dimensions from 5/4 decking to 12×12 posts. Manufacturers include American Composite Timbers (www.compositetimbers.com), Bedford Technology (www.plasticboards.com), and Trimax Structural Lumber (www.trimaxbp.com). Decking refers to the boards or other material that form the top surface of a deck. Decking should be durable. If wood decking is used, the boards should come from trees that were sustainably logged. A wide variety of materials can be used as decking. Pressure-treated softwood remains the most economical choice for exterior decking, but the development of the first wood-plastic composite by Trex in the mid-1980s cleared the way for the wide variety of synthetic decking that has since entered the market. Other choices include all-plastic and aluminum decking as well as several hardwood and softwood species well suited for use outdoors. In all, consumers have an extremely wide selection, many of them with environmental advantages over the pressure-treated standard. Redwood and cedar are both native North American species whose heartwood has a high resistance to damage from insects and weather. Both are relatively soft. Old-growth forests that produce the best tight-grained lumber have steadily declined, however, and the wider growth rings and lower density of most of today’s lumber won’t prove as durable. The sapwood of either species is not resistant to decay. Redwood, western red cedar, and Alaskan yellow cedar should be avoided unless the Forest Stewardship Council (FSC) certifies that the lumber has been harvested using sustainable forestry practices. Where certified lumber is available, it makes a durable and naturally beautiful decking. IpÃ©, a South American hardwood, is dense, heavy, and highly resistant to damage from insects and moisture. It fades from a deep reddish brown to silver with exposure to sunlight. IpÃ© should last for many years outside without any chemical treatment. Sources for FSC-listed ipÃ© are increasing. Southern yellow pine and hem-fir saturated with copper-rich compounds show good weather and insect resistance, and they are among the least expensive decking options available. The most common chemical treatments are ACQ and CBA, which have replaced chromated copper arsenate (CCA) for most residential applications. Although they are less toxic than CCA, ACQ and CBA will corrode untreated steel fasteners and hardware. The high copper content also makes the lumber harmful to some aquatic organisms. Treated pine tends to cup and check more readily than other wood decking, and it should be treated periodically with a water repellent. Trex was the first product made from wood flour blended with recycled polyethylene bags; a number of companies now offer decking made of similar ingredients, and other types of plastic also are used. Wood-plastic composites have diverted millions of pounds of plastic from landfills, and the decking shows fewer of the defects that typically affect wood. Composites are not, however, maintenance-free products. Because they contain cellulose in the form of wood flour, composites can support the growth of mold and should be cleaned regularly. Colors are likely to fade over time. Formulations vary among manufacturers, as does the proportion of recycled plastic. Polystyrene, high-density polyethylene, polypropylene, and polyvinyl chloride (PVC) are all forms of plastic that are manufactured into decking. Because they don’t have any wood content, they don’t have the mold problem that composites have. Plastic decking shows greater thermal expansion and contraction than composites or wood, and it is not stiff enough to be used in structural applications. A more recent development is cellular PVC decking, which is made by adding a foaming agent to PVC. Cellular PVC handles and looks much like wood. Plastic decking made from recycled material has an environmental advantage over material made with virgin plastic. PVC decking, however, is difficult to recycle, produces hazardous by-products in its manufacture, and releases dioxin and other contaminants when burned. When choosing plastic decking, look for brands with high recycled content. Powder-coated aluminum decking has many performance advantages, including great strength and fire and insect resistance. It’s highly resistant to stains and dirt. Aluminum also can be easily recycled. It is not an aesthetic replacement for wood, as composites and plastic lumber are intended to be, and it also is more expensive than many other types of decking. Possibly for those reasons, its residential market share is low. FREESTANDING DECKS DON’T ROT HOUSES because they don’t cut into a home’s skin. Freestanding decks make a lot of sense for homes with a brick or stone veneer because codes don’t allow load-bearing ledgers on nonstructural masonry. Decks, porches, and patios can be important living spaces, creating an appealing transition between indoors and outdoors. 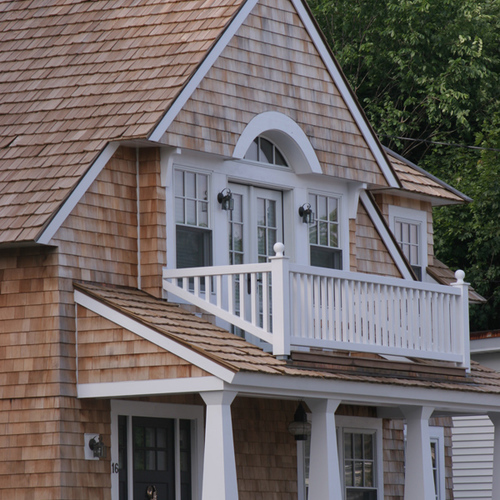 Because they are exposed to the weather, decks and porches will not be as durable as the rest of the house unless weather-resistant materials and installation techniques are used. Perhaps most important, special attention must be paid to how decks and porches attach to the rest of the house. 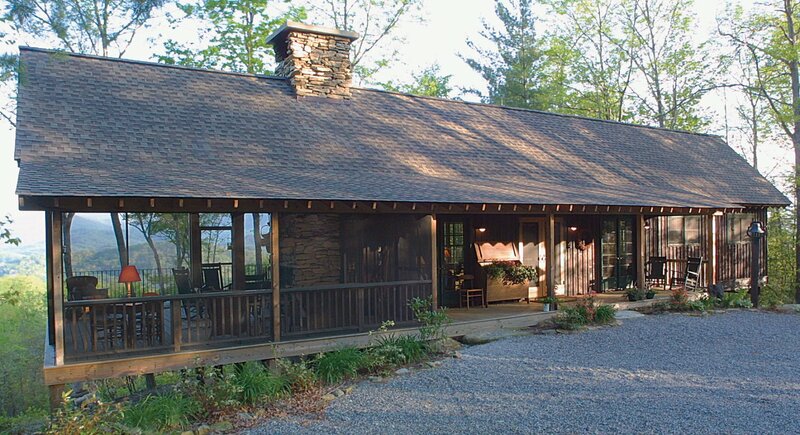 While decks are open to the sky, porches are roofed. Grade-level decks with a top surface of concrete, brick, stone, or tile are called patios. FOREST CERTIFIERS KEEP TRACK— so you don’t have to. Forests, Mills, and actual wood products can be certified in a variety of ways. Forest Stewardship Council (FSC) meets LEED-H requirements. Some other certification systems, such as Sustainable Forestry Initiative (SFI), don’t. Wood once was virtually the only choice for deck and porch surfaces, but a number of rivals have emerged in recent years. Pressure-treated softwood remains a popular low-cost option, but a growing number of exotic species also are available. The key is selecting wood that has been grown and harvested using sustainable forestry practices. For other decking materials, toxicity and recycling potential are important criteria. THIS HOUSE IS HALF PORCH AND DECK. Perched atop a mountain in western North Carolina, this house’s porch and decks are living space much of the year. 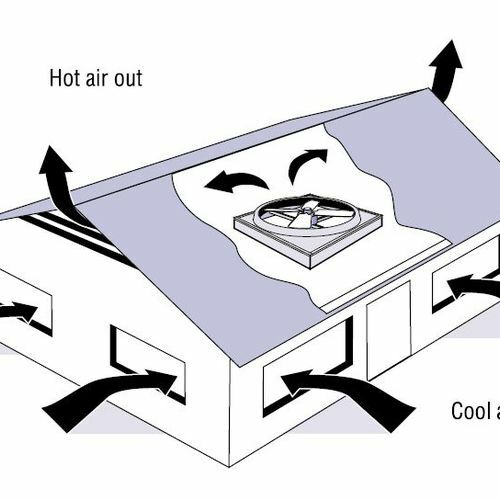 While the roof still extends over it, there’s much less space to heat in winter. Because decks and porches are not part of a home’s conditioned space, there is less need to keep them small. It’s better to have a small house with a big deck than vice versa. Unlike great rooms, large decks don’t carry an energy penalty. Slope the floors. When a porch is built with gapped decking, there’s no worry of standing water. Traditionally, however, porches have had tongue-and-groove flooring. Many builders slope the framing away from the house to shed any water that blows in, but there isn’t universal agreement on this feature. Virginia builder Scott McBride, for example, suggests that, in practical terms, a flat floor works as well as a sloped floor. A roof overhang and insect screens will keep out most of the rain, and surface tension prevents water from flowing off a sloped deck in anything short of a deluge. Build the floor level, McBride says. Consider width of openings. Wide openings make for a good view, but they also mean less resistance to racking. John Abrams, a builder on Martha’s Vineyard, Mass., spaces posts between 28 inches to 32 inches apart, which he says provides adequate structural support while still admitting plenty of light and air. Use an intermediate rail. Screen openings that run the full height of the wall provide a better view, but an intermediate horizontal rail in the lower third of the wall makes the structure stiffer. A solid knee wall adds even more protection against racking. Make the ceiling solid. A flat ceiling made from plywood (for strength) or bead board (for appearance) will provide more structural stiffness than a vaulted ceiling. Metal bracing installed on top of the rafters in an “X” pattern also stiffens the structure. Choose replaceable decking. When deck boards run all the way to the edge of the porch and walls are then built directly on top of them, replacing damaged or rotten decking is a headache. A way around the problem is to hold decking back from the edge, installing it over an extra 2x ledger. With wall framing and decking separated, replacing individual boards is very easy. Keep the deck below the threshold. In snow country, it’s a great idea to step decks down at least one full step. Flush decks can be much harder to flash properly, and rain and snow can stress doors adjacent to the deck. 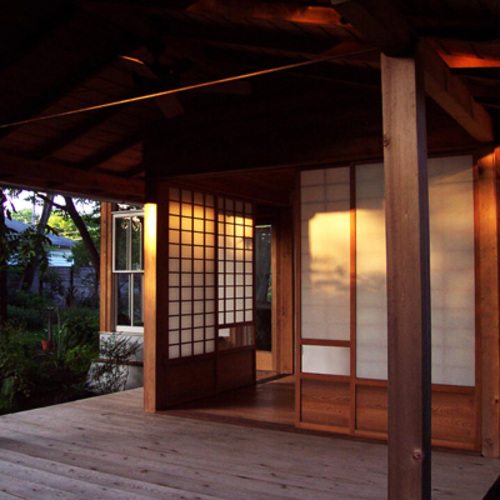 When put into practice, some or all of these techniques result in a structurally sound and visually pleasing porch. Three things affect the number and the size of piers you use: the way you frame the deck; the weight the deck is designed to handle; and the load-bearing capacity of the soil. Consider a deck supported by a ledger and a double rim joist bolted to piers. The IRC’s design load for decks, is 50 pounds per square foot (psf) (40 psf live load, 10 psf dead load). Different soil types have different bearing capacities (measured in psf); consult Table 401.4.1 of the IRC for these bearing capacities. Step 1. Space the piers evenly according to what the double rim joist can span. For this 16-foot deck, four piers. Step 2. Distribute the deck’s weight onto the piers. A 12-foot by 16-foot deck is 192 square feet. Multiply by 50 psf to determine the design load, 9,600 pounds. Half of that weight (4,800 pounds) is carried by the ledger, the other half by the piers. Because the corner piers carry only half the weight that the inside piers carry, they can be smaller. Divide 4,800 pounds by three to find out what the two inside piers must each bear — 1,600 pounds. The corners each bear 800 pounds. Step 3. Transfer the weight to the soil. The bearing capacity of the soil tells how big the piers have to be in order to safely distribute the load. Hard-packed gravel has a bearing capacity of around 3,000 psf. Using the table below, multiply the square-foot equivalent of each tube by 3,000 psf to find one that will work in this soil. A 10-inch tube will bear 1,650 psf. Many decks and porches are built over wood framing — typically pressure-treated 2x material — but a base of stone, brick, or concrete can also be used. These materials won’t rot, are highly durable, and are cool to bare feet in the summer. Vent columns and newel posts at both top and bottom. Avoid unnecessary wood-to-wood contact that can trap moisture. Regardless of the framing lumber you choose, include details that let the framing lumber dry out after it gets wet. Even treated lumber is not rot-proof. When building up a beam or other structural member from two or more pieces of lumber, separate the planks with a spacer so that water won’t become trapped between them, or cover the top of the beam with a strip of self-adhering membrane to keep water out. 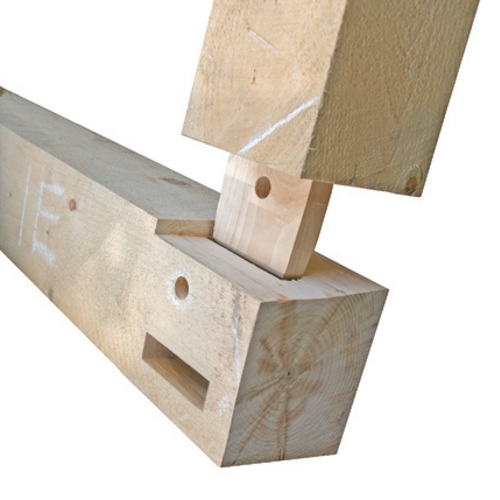 Post supports that keep wood out of direct contact with concrete will help posts last longer. Install a grate at doorways, flush-mounted into the decking, to reduce the quantity of mud and snow tracked into the house. Downsize the corners. There’s no sense in using more concrete than necessary. Use safer pressure-treated woods. Green choices exist in framing lumber, decking, and railings too. LEED-H MR2.2 (Materials & Resources) offers 1/2 point for decking that is FSC-certified, salvaged, or recycled-content; 1/2 point more if it is locally sourced. NGBS Under Chapter 6, “Resource Efficiency”: up to 5 points for covered entryways (602.1); best-practice deck/porch flashing details on plans contributes to 6 points total for flashing (602.12); up to 6 points for insect resistant decking materials (602.8); up to 3 points for recycled-content decking (604.1); contributes toward up to 8 points if wood decking is certified (606.1).